As a tuckpointing and masonry contractor in Lake Barrington IL, we’ve been using high pressure washing equipment on a daily basis. Pressure washers are a very fast and efficient way to remove debris, dirt, dust, grime, mold, and even paint from the surfaces we are working on. It saves us time and provides you with a clean surface after our work is finished. 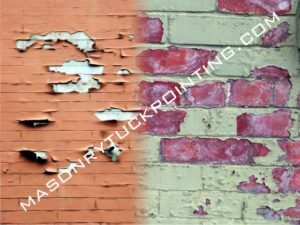 A typical use of pressure washing in Lake Barrington IL for a tuckpointing contractor is to remove dust and debris from the surface that’s being preparing for re-pointing. Besides cleaning your masonry wall, power washing and wetting of the surface ensures maximum bond of the new mortar. There are also other areas where using a high pressure washing generates quick, and sometimes remarkable, effects. We’ve been contracted for the removal of a variety of heavy stains with high pressure washers from masonry surfaces on residential and commercial structures. Often it is simply the age of a surface and the accumulated grime that needs to be removed. Sometimes, years of leaking gutters in a shaded area result in a mold and / or moss species growth. Brushing it off the surface may work in some cases, but aged contaminations and stains require a little more than that. Occasionally, cleaning agents might be added to the water pressure washing equipment. Mixing the high pressure stream of water with sand blaster will also help in paint removal, which we do as well. Painted masonry surfaces can be stripped clean using other techniques like stripping chemical agents or a heat gun. Unfortunately, as both are extremely time consuming, we don’t recommend them. The speed and effectiveness of a high pressure washer combined with a sand blaster is unbeatable with any other tool or equipment. It isn’t recommended to even attempt to start a larger paint removal project with hand tools; water pressure washing and a sand blaster combination is an extremely affordable and time saving solution. In case you have plans to use your own high pressure washing equipment in Lake Barrington IL, here are some tips that might save you time and lessen the frustration. Removing paint with a high pressure washer from softer materials like wood / siding might result in severe damage to that material. Pressure washers are great for cleaning the surface before painting, even removing some loose, peeling paint, but not for stripping it off the soft materials. You have to choose the right nozzle for each project. If this is the first time you’re using your power washing equipment, you should read the instructions carefully. Most power washers come equipped with a few color coded, exchangeable nozzles. Check your own description, but in most cases red (0 tip) produces the strongest stream of water that can damage any softer surface and puncture your skin. Never put your hand in front of a spraying nozzle or point it at your or anybody else’s body. Protect your body, or at least your eyes and face with goggles / full face mask. Flying particles of dirt or anything that might become loose during pressure washing can be dangerous. Do some practice on the surface you’re about to clean first and pick a small, non conspicuous area for testing the nozzles. If you don’t feel like experimenting or the job is simply too big and difficult, give us a call and will be happy to examine your site and provide you with a high pressure washing Lake Barrington IL and / or paint removal estimate.